Posted on April 14, 2010	by Lou Murray, Ph.D.
I’m behind, as usual. That’s why I’m doing Harvest Monday late on Tuesday. And after I get this post done, I need to process and send photos to the paper to go with my Thursday column in the HB Independent, and then post a blog to accompany it. Arg, it’s already 10:30 pm. Does anyone else find it daunting trying to work, manage a household, garden (including caring for chickens), cook, compost, and keep up with blogging? 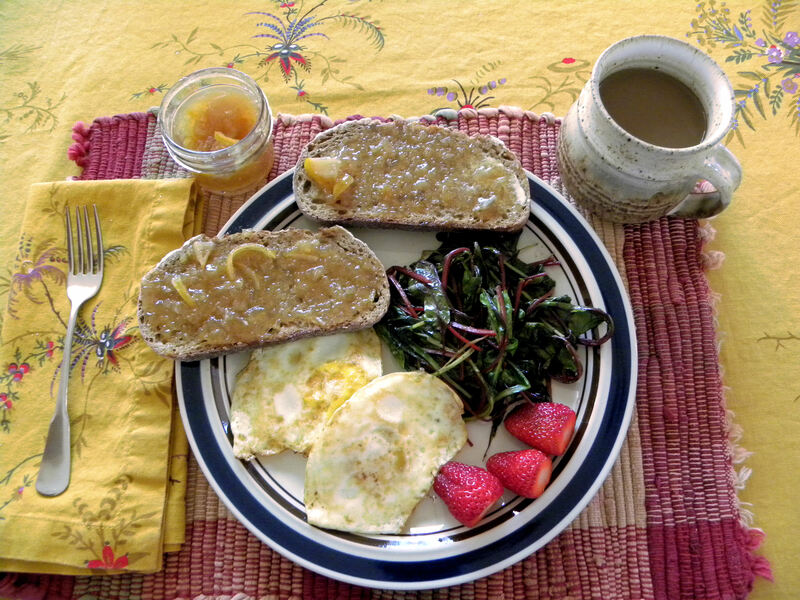 Brunch from the garden included my first strawberries, sauteed baby chard, fried eggs, and homemade bread with homemade Meyer lemon marmalade. Part of being busy this week included NOT photographing most of the harvest this week, including NOT photographing some of the delicious meals I made with it. Too bad, because the stirfry with snap peas, red bell peppers and red onion was beautiful and tasted fabulous. BTW, my blog hit count is up to 9,639. I may hit 10,000 sooner than April 18, which is when I thought the count would roll over that number. To see what others are harvesting this week, or to add your own harvest, visit Harvest Monday at Daphne’s Dandelions. This entry was posted in Uncategorized and tagged harv, Harvest Monday, vegetable garden. Bookmark the permalink. That is a wonderful garden brunch. I don’t have strawberries right now, but I can’t wait for the farmers markets to open in June so I can eat all the local strawberries. Yum. Hi Daphne. My strawberry harvest looks like it’s going to be very small, given that I have only one strawberry pot. I’m hoping that the harvest will extend over a long time at least. This is my first attempt at growing strawberries, so we’ll see. I hear you, I hear you, how do we have time to blog in addition to everything else, including gardening, cooking and preserving our harvest is a mystery. You did well, though, this brunch looks delicious! Thanks Angela. After spending all day in the garden today, I was beat. My long-suffering husband cooked dinner after he got off work. How did our ancestors do it, plus spinning, weaving and making all their own clothes, candles, cheese, etc.? And with a dozen kids underfoot as well. Last week we got so many strawberries from the pot out front that Chi asked me to make a pie out of them! I also got a nice batch of mange-tout peas and some French filet beans I planted last fall that hung on through the winter and are continuing to produce. The beets are almost done too. Will you share your recipe for the Meyer lemon marmalade? Pretty Please? Glad I’m not the only one with a heavy load. Here I am after midnight finally getting around to my blog after a hard but enjoyable day of spring planting. Oh, how to share the Meyer lemon marmalade recipe? I used the one I found on Thomas’s site at A Growing Tradition. There is a link on my sidebar. I’ll bet that if you search for Meyer Lemon Marmalade Recipe, you’ll find it as it originally appeared in Gourmet. Thomas added a bit of ginger, and so did I.